The relevance to the Talpiot Tomb claims is that a cluster of names in a given tomb is only impressive if that cluster is not contaminated with non-matches and contradictory evidence. It is true that Jesus son of Joseph, Mary and Joses are also found among Jesus' family names in early Christian texts, but Matthew and Judas son of Jesus are not. James Tabor has offered two different versions of the stick man, utilizing different lines on each occasion, the earlier version to the left above and the later version to the right. In my analogy, this is akin to the Texas sharpshooter drawing the target around holes, or here to the attempt to isolate specific lines that may or may not help us to see the presence of a stick man differently configured each time. This interpretation, attributed to James Charlesworth, isolates parts of some of the lines seen in at the bottom of the vessel (the "head" of the "fish") and suggests that they spell out the name Jonah, YWNH. The difficulty is that there are lots of lines there, and one can only see YWNH by ignoring lines and parts of lines. Once again, it is like the Texas sharpshooter drawing his target around the bullet-holes in the side of the barn. 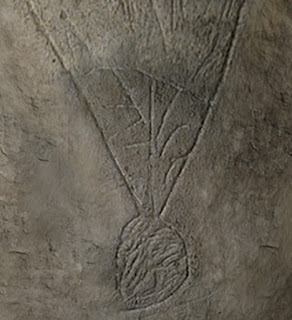 (See further Do the lines in the "fish" head spell out Jonah; With Each New "Jonah Ossuary" Photo, Multiple New Problems and links there and Talpiot Tomb B: Connected and Unconnected Lines). Anywhere people are searching for meaning, you will see the Texas Sharpshooter Fallacy. For many, the world loses luster when you accept the idea random mutations can lead to eyeballs or random burn patterns on toast can look like a person’s face. And of course it is possible to spot the face of Jesus on the side of one of the ossuaries in Talpiot Tomb B, just as it is possible to see a fish in another ossuary in the same tomb, a stick man and letters in its head, and Jesus' family in the tomb next door. Just over a week ago, James Tabor discussed an interesting suggestion made by James Charlesworth that the name "Jonah" might be spelt out in Hebrew letters in the head of what they see as the "fish" in Ossuary 6 in Talpiot Tomb B, the image that others see as some kind of vessel or vase, Name of “Jonah” Encrypted on the Jonah and the Fish Image (see also The Hebrew Name “YONAH” Embedded in the Image of the Fish on the Talpiot Tomb Ossuary). 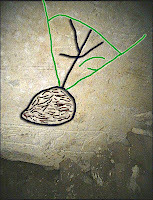 My worry about the suggestion was that it led to a revision of an already problematic aspect of the case, the idea that the image featured a "stick figure" of Jonah emerging from the fish, a point made by Stephen Goranson and illustrated in my post headed The Changing Body of the Stick Man in Talpiot Tomb B. But more importantly, the suggestion about the letters spelling out Jonah was received with scepticism -- Christopher Rollston in the Globe and Mail aticle; Jim Davila in Paleojudaica, Antonio Lombatti, Robert Cargill, Robert Cargill again, Steve Caruso and Steve Caruso again. Now James Tabor makes clear that, as far as he is concerned, the Inscription on the “Jonah image” Says YONAH. He complains about several blog responses and he quotes from troubling posts that I have not seen. My preference is, of course, to deal with matters of substance and there is something I would like to draw attention to. 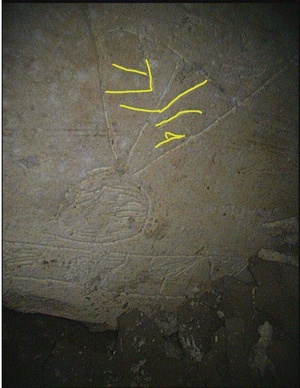 Image (bottom) on Ossuary 6. Original image here .Coloured lines courtesy of Robert Cargill. On the left is a close up of the bottom of the image as it appears on ossuary 6. On the right is Robert Cargill's representation of the engraved lines. The alleged nun is here represented by the yellow and green lines in the picture on the right. But how do we test the competing claims? Is the alleged nun here continuous or broken? Tabor maintains that the letters are "crystal clear" but I remain sceptical. One of the main reasons for my scepticism is that the break in the middle of the alleged nun is actually "crystal clear", to borrow Tabor's language. This is not a nun; it is two random lines. Indeed, one can test for the clarity of the lines here by returning to the CGI composite image of what is depicted on ossuary 6. This image aims to represent what the authors of the project used to regard as clear and self-evident and yet it is quite clear that before this new "Jonah" reading had been proposed, they too saw a break in the line that is now held to be a nun. In other words, before the "Jonah" inscription interpretation, they too could not see the continuous line of a letter "nun". drawing attention to the break in the alleged nun. Update (4.45pm): See now also Antonio Lombatti, Is YONAH there or not? and Robert Cargill, When is a nun not a nun?. (See what he did there?!). See too Steve Caruso, Unfaithful Representation. It's looking slick and professional and there are already a couple of posts, one on the First Century Copy of Mark? that has previously been discussed here and elsewhere and one on his new book about Jesus Mythicists. Extra goodies are hidden behind a paywall, including an extension of the above post on the first century Mark fragment. Also, only paying members are able to comment on blog posts. Money earned from the site will go to assisting the needy. I am not aware of other academic bloggers who have added a paywall, so it will be interesting to see how the blog fares. I am looking forward, though, to the public posts. Welcome to the blogosphere, Bart! 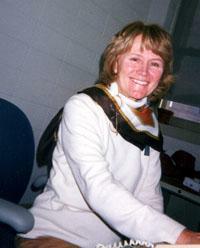 I was sorry to read, on Kathy Schiffer's blog on Patheos, that Jane Schaberg has died. Jane Schaberg was Professor of Religious Studies and Women's Studies at the University of Detroit Mercy and is most well known for her controversial but thought-provoking The Illegitimacy of Jesus which recently (2006) celebrated its twentieth anniversary with a new edition. She has also published extensively on Mary Magdalene, including The Resurrection of Mary Magdalene: Legends, Apocrypha, and the Christian Testament. Her passing is a great loss. 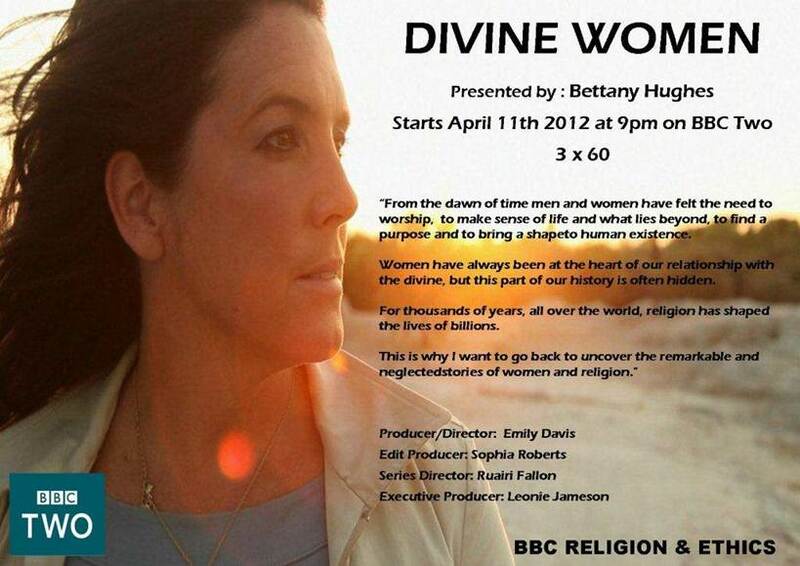 I meant to mention this last week when Leonie Jameson (Executive Producer) sent it over, but there is a new three-part series on Wednesday evenings on BBC2 entitled Divine Women. 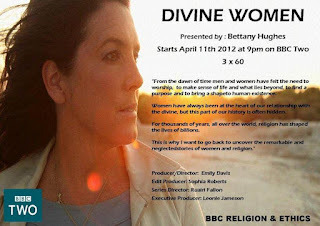 It is presented by Bettany Hughes. There is more too at the Open University. I was a consultant on the episode that airs tomorrow night, Handmaids of the Gods. 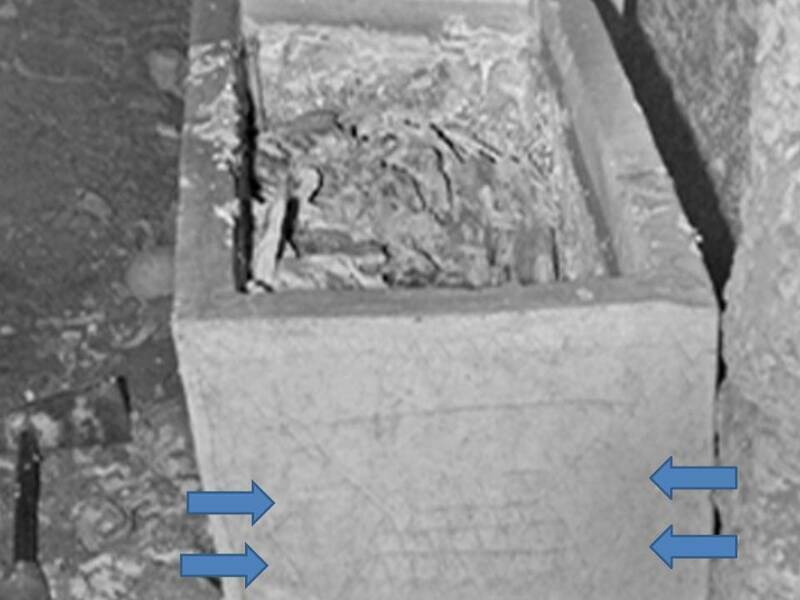 Over on the ASOR blog several days ago, "Jonah" Ossuary discussed in print in 1981, Eric Meyers and Chris Rollston brought to our attention Zvi Ilan's report, in DAVAR in May 1981, on the discovery of what is now called Talpiot Tomb B. The report was revealing because it mentioned the sighting of a vase or vessel on one of the ossuaries and it mentioned nothing of a "fish". As for what the article says; it refers to “architectural façades (belonging to the Temple? ), a vase and two names written in Greek.” So it seems that the “vase” reference is not to the Jonah image at all! The article speaks about Temple “façades” or “features” in the plural i.e., the fish is subsumed under “Temple façades,” since it is carved next to a Temple-like structure on the front of the “Jonah ossuary.” The “vase” is a separate item altogether and it’s referred to in the singular, probably what we have identified as the tail of a fish at the backend of the ossuary. Since Ilan does not seem to know about the four line Greek inscription, or clearly mention the Jonah image, my guess is he might be referring to the “half fish” (Cargill and Goodacre’s vase with handles) that is clearly visible in the photos in Kokh 1, ossuary 1, and NOT the Jonah image that is on its face since this account implies Kloner was in and out very quickly without moving the ossuaries. This is a detail taken from Kloner's original 1981 investigation of the tomb, with arrows pointing to the handles (from here; see also here; new photograph here). I suggested that this picture of a vase provides key contextual information about the interpretation of the picture on the façade of the same ossuary (see Robert Cargill's Sins of Commission and Omission for more). A vessel on the end of the ossuary; a vessel on the façade of the ossuary. Compare, for example, these images from Rahmani's catalogue shared by Tom Verenna in which there is a vessel on the end of the ossuary, and a vessel on its façade. Now of course it could, in theory, be that there was a vessel on the end of the ossuary but a "fish" on its façade, but the very fact that Jacobovici and Tabor have insisted on the "half-fish" interpretation for the end of the ossuary suggests that they are aware of the importance of contextual clues. However, I must admit that I think it most unlikely that the DAVAR article is referring to this vase on the end of the ossuary. The more striking image is the one on the façade and I cannot imagine that the vase on the end of the ossuary would have commanded their attention more than the one on the façade. Either way, the article is telling for another reason. Simcha Jacobovici recently suggested that the reason that many scholars do not see a "fish" is that they are involved in some kind of "theological trauma". But as Paul Regnier commented , "Quite how can you be traumatised by a viewpoint that won’t actually exist for another 30 years?!" However one attempts to spin this one, the original investigators did not see any fish on this ossuary, and I am afraid that that is telling. I would like to take a moment to congratulate Stephen Carlson who has successfully defended his PhD dissertation here at Duke. His thesis title is "The Text of Galatians and Its History". Bart Ehrman and I were co-advisors. Joel Marcus, Douglas Campbell and Michael Holmes joined us on his committee. Those of you who already know Stephen's work will not be surprised to hear that his thesis was outstanding, and his defense of it exemplary. If we awarded "honors" here at Duke, or "graduation with distinction", this thesis would have received that award. Very many congratulations to Stephen on a richly deserved PhD. I feel a great sense of pride to have been able to work with him during his time at Duke. He is a bright star of the future and I know that I will not be the only one who will follow his career with great interest. I was just listening to The Film Programme on Radio 4 and it begins with a discussion of The Gospel of Us, a new film that comes out this weekend in the UK. I am ashamed to say that until hearing this feature, it had completely passed me by. Passion plays are like Titanic for Christians: it's a tale they never tire of hearing, despite knowing how it ends. Sheen's secularised approach (his Christ figure is referred to as the Teacher) was spread over several days at venues in and around Port Talbot, an impressive theatrical undertaking that deserved to be recorded for posterity. Dave McKean's film is a stylised documentation of the event, a bold attempt to turn it into something more cinematic. He keeps things visually interesting and exciting, overlaying images and using the occasional separately filmed segment. For the most part it works well, although having all the dialogue virtually shouted (a necessity in outdoor theatre) doesn't help. The director Dave McKean admits he's an atheist, which is fine, but denuding the Easter story of any religious dimension is surely nuts. He says he's exploring "belief systems" but fails to show what anyone here believes in. Sheen calls himself Teacher, and all he does is pass around sandwiches (the feeding of the 5,000, I think) and ask people to tell him their "stories" – as if in this age of blogging people need encouragement. The Teacher has provoked evil corporate profiteers who want to exploit the town's resources. How he could threaten them never becomes clear. Sheen is a Messiah figure without the mystery, majesty or dark wit that characterised Jesus. Instead of giving great speeches to inspire followers or worry enemies, he just looks vaguely beatific, like a local boy made good. The conceit of it is at once narcissistic and completely banal. IMDb's entry is here. BBC News has a feature and an interview. And there are three clips here. The chance of catching it in one of the cinemas here is pretty remote so my guess is that I will have to wait for the DVD. I am delighted to have the opportunity to blog the following guest post from Prof. Richard Bauckham. It is also available as a PDF file here. This comment obviously depends on the usual explanation of Arimathea as representing the Hebrew place name Ramathaim (1 Sam 1:1), and correctly notices that this is a dual form of the word ramah. The latter means ‘height’ but is scarcely used except in place-names, either alone, as Ramah (there are 4 or 5 towns so-called in the Hebrew Bible), or in compounds, such as Ramoth-Gilead. In such cases, it designates a town built on a high place. For the Arimathea/Ramathaim from which Joseph is named, there needs to be a town, not just an estate ‘dominated by two hills’. That there was a town, or even small village, called Ramathaim, so close to Jerusalem but mentioned nowhere else in our sources, seems unlikely. The most likely identification of Joseph’s place of origin is with the Ramathaim (textual variant: Rathamin) mentioned in 1 Macc 11:34 as the headquarters of a toparchy transferred in 145 BCE from Samaria to Judea. This Ramathaim is clearly not near Jerusalem, but near the borders of Judaea and Samaria. Eusebius’s Onomasticon places it at the village of Remphis (Israel map grid 151159), which is about 30 km north-west of Jerusalem. It should be noticed that the dual form of Ramathaim is an archaic form, which has survived unusually in this place name (otherwise only in 1 Sam 1:1, which may refer to the same place, evidently called Ramah later in the narrative of I Samuel). It is therefore very distinctive (unlike the common Ramah) and we should not multiply Ramathaims unnecessarily. So the only shred of evidence presented in the documentary for identifying Talpiyot Tomb B as that of Joseph of Arimathea is entirely without value. 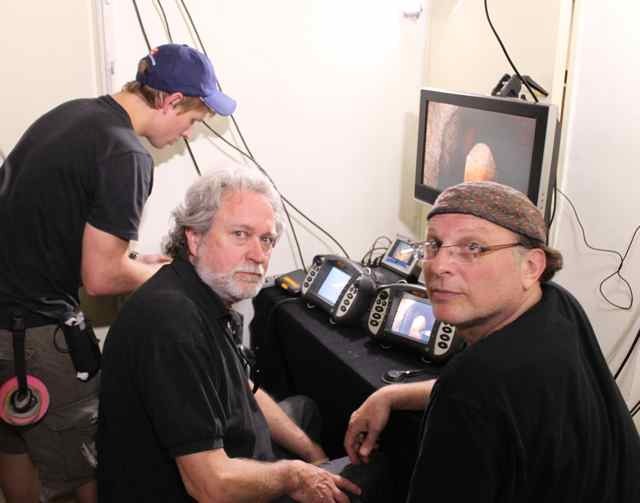 I am live blogging a commentary on The Resurrection Tomb Mystery documentary that is airing on Discovery Channel (USA) tonight, 10pm EDT. It is airing at the same time in Canada as The Jesus Discovery (Vision TV). It's a while since I have done one of these live blogs, but I have been posting so extensively about this tomb over the last six weeks that now seems like a good time to do it. The idea is simply that I tap away on my laptop while I watch. If you want to follow along, you'll have to remember to hit the "refresh" button from time to time. The way that this tends to work is that I blog the most during the ad breaks. On this occasion, I am particularly excited about actually getting to see some footage of the tomb. Although I have been heavily critical of the claims being made in the published materials so far, I am nevertheless genuinely excited about seeing inside this early Roman period (1st century BCE to 1st century CE tomb). I'm sure that that footage will be the highlight for me. 9.58: tuning in. Discovery are showing a documentary on Jesus to get people in the right mood. Just realized that I need to feed the cats and grab a glass of wine before I settle down. 10.00: Starting. Begins with a note that people will disagree about what they see. Goes on with a flashback to the previous documentary from 2007. Note: Bob Cargill is also live-blogging over on XKV8R. Ok, they are cracking on with it. Good. Already talking about the 1980 excavation of Talpiot Tomb A. Nice black and white style reconstruction as if we are looking at real footage. Now some footage from the 2007 film. Explanations of the cluster of names from the Talpiot Tomb A, Jesus Son of Joseph, etc. And now the first contribution from James Tabor saying that the Talpiot Tomb is Jesus' family tomb. 22.04: They talk about the controversy, but imply that the problem comes from fundamentalists, not scholars who find the claims implausible. Now they are doing a nice reconstruction, again in black and white, of the 1981 excavation. They show two of the pictures from 1981. Good to see. 22.06: the name of Joseph of Arimathea is brought up for the first time. First worrying sign. And now "Two hills" are linked with "Arimathea" to link the tomb to Joseph of A. This is very weak. Bear in mind that there is absolutely nothing in this tomb that links with Joseph of Arimathea. 22.08: the Haredim manage to shut down the excavation; shots of activists disrupting the excavation. 22.09: explanation of how they are looking for the tomb and using GPR. 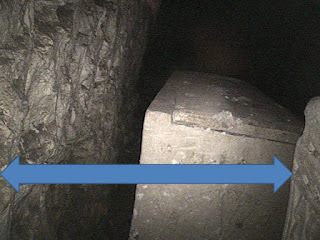 They do not mention the fact that they already sent cameras down into the tomb in 2007, and that there was footage in the documentary of the ossuaries and the inside of that tomb. Unless I missed it, the implication is that they did *not* go into the tomb at that point, and that they are looking for it here afresh. 22.10. First ad. break. 22.13. Starts again. They don't know how to access the tomb. James Tabor and Rami Arav now introduced formally. They need to get into the tomb somehow without going in themselves. William Klassen is now being introduced in Toronto -- robotic arm and the camera. This is easily the most interesting and important element, in my opinion, in the documentary. Fantastic new technology and the chance to see an early Roman period tomb. 22.15: "What would an early Christian symbol look like". They go to Rome with Robin Jensen to look at possible Christian images. Catacombs. Simcha asks Jensen, "Jonah is Christian?" "Oh yes". In context here, yes! Bear in mind that Robin Jensen has made clear that she does not endorse the claims made in this documentary about the "fish" in the Talpiot tomb. But there are further problems -- we should not be going in, expecting to find Christian images. This is predisposition. 22.18: We are back in the attempts to get into the tomb. Finding problems getting in, etc. And now "the moment we have been waiting for". 22.19: Another ad break. Nice to see the Geko with a British accent. OK, a third of the way through and we are not yet in the tomb. But it's on its way. Audience have been told that if we find Jonah and the fish, then we have an early Christian image of resurrection. So what's the guessing that they are going to find Jonah and the fish? I've just heard that Tom Verenna is live blogging too. Don't forget to check up Robert Cargill too. If anyone else is live blogging, let me know. 22.24: longish ad break. Starts again. Robotic arm stuff and general recap. Simcha "believes . . . the tomb of Joseph of Arimathea". This is persuasion by repetition. Bear in mind that there is nothing to link this tomb to Joseph of Arimathea. Absolutely nothing. 22.25: The camera is going in. We are getting the shots of the tomb. Simcha and company is thrilled. "Almost there, almost there", they say. Don't get that. Almost where? What are they looking for? 22.27: Fabulous to see shots of ossuary one, and the snaking through. Tabor: "It's really ornate, befitting a wealthy person" So Joseph of Arimathea, then?! They are showing the Nephesh on ossuary 1. Nicely done. 22.28. Moving to kokh 2. They are calling them "niches". Looking at ossuaries 2, 3 and 4. Looking at ossuary 4, MARA spelt out. 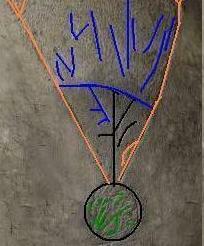 They are linking it with Mariamene Mara from Talpiot Tomb A. Now linking with Mary Magdalene. Here we go. I just want to look at the ossuaries; I don't want all this stuff. They are pressing on after making progress. But the cable has snapped and they've hit a problem, a problem of the kind that in documentaries requires an . . .
. . . . ad break! Half way through the documentary now. For me, a highlight is seeing the footage of the ossuaries. I am not enjoying hearing repeated, unfounded references to Joseph of Arimathea. Just checked up on how Robert Cargill is doing in his blog and he also spots the repeated references to Joseph of Arimathea. Ad break is going on a bit, so checked on Tom Verenna's too. He notes that they had already seen these ossuaries before in 2007, so there is an element of staging here. 10.34: we are off again. Broken robotic arm. This will last a short while and then we will overcome it and carry on. Documentaries have to have a few crises. "The exploration appears to be over before it really begins." Repaired and back. Good. Now let's see some more ossuaries! 10.36: looking at kokh 3, plain ossuary and no inscriptions. They are running out of options. No Joseph of Arimathea, they say. 10.37: now they are approaching ossuaries 5 and 6 and we are about to have whoops of delight, I am sure, when they see the vessel on one of the ossuaries. They talk about looking at "number 4", which can't be right. They see "the cross". Here we go. 10.39: "earliest Christian related cross ever found". And that requires an ad break! Two thirds of the way through and we have not yet got to the "fish" business, and the inscription. It'll be coming shortly. 10.42: resumes. Summary. 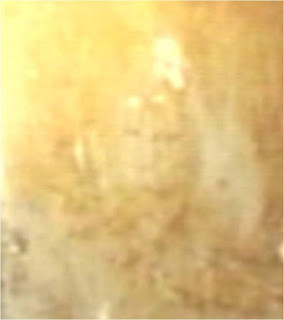 Haha, there's the Jesus face that that "Duke professor" found. "We have a cross which I think is a Christian cross". But Tabor says, we don't have anything that links it to the tomb next door. 10.43: they have found the image. Close ups of the image of the "fish". Rami Arav thinks it is a nephesh. Simcha thinks it's a nephesh. The others disagree. "Those could be the handles". They saw the vase first. "That's Jonah's head . . . it's spitting Jonah out" And here's the composite cgi version emerging. The stick figure, the fish; and the fish inked in -- even more strongly than in the pics. This whole section is pretty depressing to those of us who have spent time studying the image. 10.47: the earliest Jesus symbol ever found. They are all thrilled with it. The documentary repeatedly shows the "fish" in the CGI reconstructed version, and sideways, not in the orientation it has on the ossuary. 10.48: they talk about the handled half-fish, and go to the Kloner 1981 photograph, highlighting a part of the vessel, but not the handles on the sides. Ad break. They are saving the inscription until the end. This was, as I expected, the most disappointing section of the documentary so far -- the entire way that the image was shown was front-loaded with its interpretation as a fish, oriented to one side, using the CGI reconstruction with the tapered tail, with the inked-in "fish" in the margins, and the handled half-fish. Using the ad break to check in on Robert Cargill's blog. As I expected, he was not too pleased with that section! 10.52: we are off again, probably for the last section. The CGI reconstruction is used again. They've found the inscription now. Trying to read it. "The inscription is in Greek, the dominant language of the wealthy in Jerusalem". What?! 10.53: they've called in James Charlesworth. He's looking at the inscription. He's doing the interpreting. God or Zeus or YHWH / raise up / spelling it out. "I am lifted up, says Jesus, I am lifted up". Now they are reading "God Jehovah Raise Up! Raise Up!" etc. 10.55: My wife has fallen asleep. 10.56: They are trying to use the use of the divine name to link the ossuary to Jesus. I wish they'd just show me some more of the ossuaries. 10.57: Tabor explains that he is now up to 95% linking it with Jesus. 10.58: Charlesworth explains that this links to Jesus -- Jonah and the fish and Jerusalem, where Jesus was crucified. Tabor explains that it is about Jesus' resurrection, but it's not physical resurrection of bones and flesh but a spiritual exaltation. 10.59: summing up. "Talpiot, Jerusalem is the resting place of Jesus and his family, his disciples . . ." etc. "Debate is just beginning" Well, it's been going on for six weeks or so and I'm afraid we are not persuaded. Sorry, Simcha. Sorry, James. 11.00: the documentary is over. No real surprises. One big disappointment for me was not seeing more of the ossuaries and the tomb itself. I was surprised to see just how often they mentioned Joseph of Arimathea and just how weak the attempts to link the tomb to Jesus appeared. End of live blog. Beginning of reflections! Robert Cargill on CNN discussing the "Jesus Discovery"
If you can't access the clip, go to the link here. I have now been blogging about Talpiot Tomb B for almost six weeks. Since the The Resurrection Tomb Mystery (Discovery Channel, USA) / The Jesus Discovery (Vision TV, Canada) is being broadcast tonight, I thought I would take a moment to draw things together and summarize my top ten problems with the claims that are being made. Several people have asked me for a kind of "layperson's guide" to the claims and what is wrong with them so I will attempt to provide it here. After providing a summary of the case, I will list my problems with the case as succinctly as possible. Some of these are things that I have brought up; others are things highlighted by other bloggers. I have tried to link to at least one blog post to provide more detail on each of the problems. I may update the post with more after it goes live. First, a quick survey of the context and claims. In 2007, a Discovery Channel documentary on The Lost Tomb of Jesus was broadcast, and there was an associated book and website. The creative force behind the project was Simcha Jacobovici. The claim at the centre of the documentary was that they had discovered the family tomb of Jesus in Talpiot, Jerusalem. The basis of the claim was that there was a remarkable cluster of names, several of which corresponded to names found in the New Testament. The vast majority of scholars rejected the claims being made in the documentary, the book and the website. I listed multiple Errors and Inaccuracies, all of which remain on the website to this day. Now, in 2012, there is a follow-up documentary, book and website, labelled either "The Jesus Discovery" or "The Resurrection Tomb Mystery". The key figures here are filmmaker Simcha Jacobovici and Professor James Tabor of UNC-Charlotte. The new project involves the investigation of a tomb that is next door to the one discussed in the previous project. It is labelled Talpiot Tomb B, or the "patio" tomb. 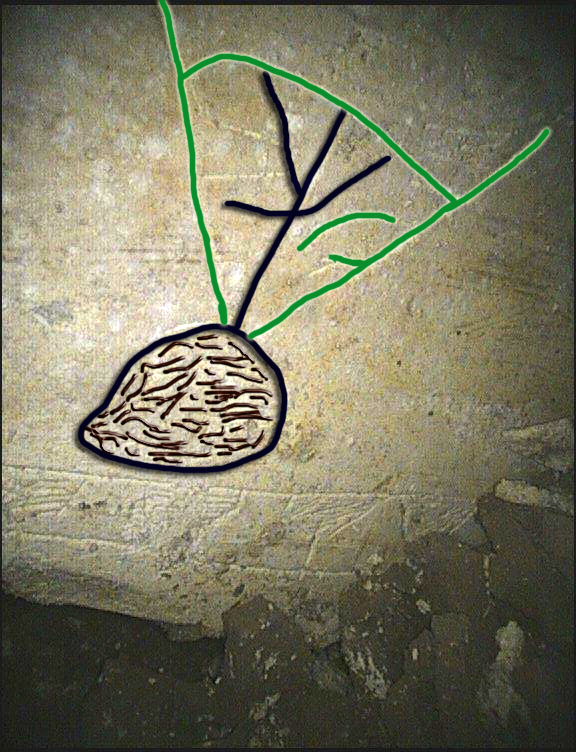 It is underneath an apartment block and has been reached by the use of ingenious, expensive technology, a robotic arm and snake camera. This is because the ultra-orthodox Jews were unwilling to allow them to enter the tomb. (1) Weak circumstantial evidence alone. There is nothing in this tomb that offers a clear and explicit link to the early Christian movement. The case is based on circumstantial evidence alone, and weak circumstantial evidence at that. (2) Handles on a fish? The claim that one of the ossuaries depicts the tale of Jonah and the fish is weak. The image is of some kind of vase or vessel. The vessel features matching handles at the top and in the middle of the image. And when is a fish not a fish? When it has handles. (See Sins of Commission and Omission). (3) Layered patterns of geometric shapes. The vessel also features layered patterns of geometric shapes. These decorations are not bizarre attempts to draw the scales of a fish -- they are decorations that match the border decorations of the ossuary in question. (See Scales of a Fish on the Talpiot Ossuary?). (4) The Composite Computer-Generated Image. The project works with a computer-enhanced, composite, re-oriented CGI image of the vessel in all of its publicity materials. The clever use of this image, which differs in important ways from the actual photographs, achieves a kind of "cognitive priming". (See If the Evidence Doesn't Fit, Photoshop It). (5) The original excavators did not see a fish. The tomb was first excavated in 1981. In a write-up in DAVAR in May that year, Zvi Ilan reported that the excavators, who actually saw the ossuary, interpreted the image in question as an amphora (a vessel). (See "Jonah" Ossuary Discussed in Print in 1981). (6) Fish in the margins. Tabor and Jacobovici claim that there are little fish in the margins of the ossuary in question. They suggest that these interpret the larger "fish". However, on closer inspection, these do not appear to be fish. They are simple decorative ovals. (See Sins of commission and Omission). (7) The handled half-fish. The image that gets all the attention is on the front facade of the ossuary. But on its side there is another image, an image of a vase with clear, obvious handles on each side. This vase helps one to interpret the other image as a vessel. Tabor and Jacobovici suggest that this is a "half-fish", pointing downwards, but the handles are problematic for this interpretation. (See When is a Fish Not a Fish?). (9) The Tomb Does Not Clearly Date to the time of Jesus. In order for this tomb to be connected to Jesus' disciples, and specifically Joseph of Arimathea, it would need to be dated to the narrow period from the 30s to 70 CE. However, the dating evidence suggests that the tomb may have been in use much earlier in the early Roman period, perhaps as early as the first century BCE (See The Dating of Talpiot Tomb B). (10) Witnessing to Resurrection Does Not Make the Tomb Christian. Even if, for the sake of argument, we were to grant Tabor and Jacobovici's claims about the tomb's inscription and iconography, this would witness only to early Jewish belief in resurrection. We already know from many texts that many Jews believed in resurrection in the Second Temple period. Belief in resurrection from the dead is not distinctive of the early followers of Jesus. The article features a few quotations from my interview. The feature goes out at 11.35pm EDT out here in NC, but it differs elsewhere. I interviewed today for ABC's Nightline programme on the Talpiot Tombs in Jerusalem and the forthcoming "Resurrection Tomb Mystery" documentary that airs on Discovery this Wednesday. I have no idea, at this point, if they will use any of that footage, or even if the segment will get bumped because of other news. James Tabor was interviewed in New York and Simcha Jacobovici in Jerusalem. I'll add an update if and when I have it. The programme is on at different times across the USA, but it's 11.30pm in our area. It should be available online tomorrow. The Dating of Talpiot Tomb B: did Jesus have disciples in the first century BCE? The finds indicate that the cave was used from the first century BCE to the first century CE (342). Now did I just read that right? Was this tomb already in use in the first century BCE? By my reckoning, that makes it a little more difficult for it to have been known as the special burial place of Jesus' disciples. Tabor and Jacobovici's speculation that the tomb belonged to the first century CE figure of Joseph of Arimathea also becomes unlikely in the light of this important detail. After coming across this detail, I went to look at James Tabor's Preliminary Report and although he refers to that page of the book, he does not comment on this detail. 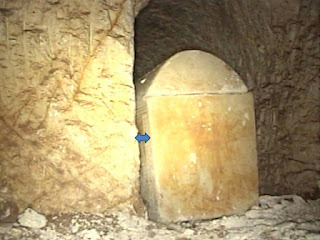 It is implied throughout that this tomb is, without doubt, first century CE. I have also checked through James D. Tabor and Simcha Jacobovici, The Jesus Discovery: The New Archaeological Find That Reveals the Birth of Christianity (New York: Simon & Schuster, 2012) and there is no discussion of the Kloner and Zissu's dating of the tomb there either. Please correct me if I am wrong, but I would have thought that attempting to date the use of the tomb in question would be fundamental to any attempt to associate it with a particular group of people. Since I have often complained in the past about my inability to make an impact in listing the multiple errors and inaccuracies on the Jesus Family Tomb website (see also Jesus Tomb: I pointed out the mistakes), I don't want to appear ungracious this time round. There is a marked difference with the 2012 analysis of Talpiot Tomb B when compared to the 2007 analysis of Talpiot Tomb A. On that occasion, try as I might, it was impossible to get those involved with the project to acknowledge the most egregious errors imaginable, and all remain to this day. But on this occasion, there has been a degree of success where I have attempted to draw attention to anomalies and apparent difficulties. 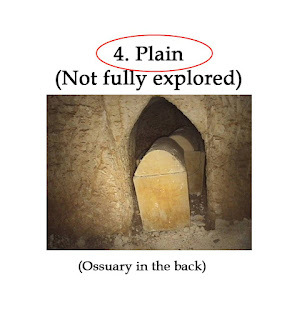 Excerpt from "Complete Findings", describing Ossuary 4 as "plain"
. . . . And while it is described as "plain" in one place, it is described as "ornamented" in another. 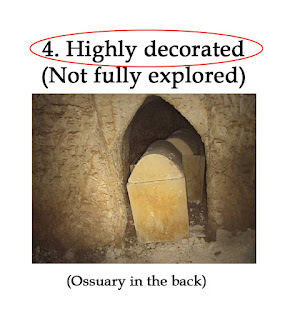 Excerpt from the "Complete Findings", describing ossuary 4 as "highly decorated"
The same ossuary is now described as "highly decorated". I am grateful to whoever made the change for taking account of my comments. They do not acknowledge me or my observation and they do not make any note on the site that they have made these changes but I am pleased to see that on this occasion blog criticisms are apparently making an impact, albeit an unacknowledged one. There is still no link to the blog post itself, nor does the notice make clear that the people responsible for producing, uploading and circulating the video are Associated Producers themselves. Since these remarks only make clear that they find the image entertaining, it is possible that this is an ill-judged attempt at mockery, but I am encouraged to see that after they have made frequent unacknowledged corrections to their website on the basis of my critiques, I have finally received a surprisingly prominent name-check! I am so busy at the moment with reading dissertations, theses, proofs and what-not that staring at photographs of the Talpiot Tomb B finds can only be a treat that I occasionally indulge in in my spare time. But there are several issues that still bother me about the photographs that have been published so far (see previously Questioning the Identity of Ossuary 4 in Talpiot Tomb B, Correction in Identifying one of the Talpiot Tomb B Ossuaries and links there) and I just want to ask a question in this post about one of them. Was Ossuary 2 moved? In this picture, we are looking at Ossuary 3 at the back. Ossuary 2 is on the front right. Now I understand that one has to allow for differences in perspectives caused by different camera angles, but I am wondering if those kind of differences are sufficient to cause the major differences between the first picture of Ossuary 2 above, and the second one here. As always, I would stress that I am only asking the question. It is quite possible that further pictures from different angles would explain the apparent differences in placement of the ossuary. OK, I admit that my title is a little facetious, but regular readers will know of my interest in Synoptic issues, i.e. accounts that differ in minor details, not only Matthew vs. Mark, Mark vs. Luke and Matthew vs. Luke, but also Acts vs. Galatians, Thomas vs. the Synoptics and so on. And I must admit that I could not resist drawing attention to a nice modern day example of minor differences in two accounts of the same event. Regular readers will also know of my interest in the Talpiot tomb, and recently of the book, websites and forthcoming Discovery channel documentary on Talpiot Tomb B. It's in relation to that material that I found this enjoyable example of two differing accounts of the same event, and something that I may be tempted to use as an analogy in my teaching on the Synoptics. I was moved when I looked through a camera on the end of a robotic arm into a pre-70 Jewish tomb. There in the darkness below my feet was an ancient tomb with bone boxes (ossuaries) clearly made before the massive revolt against Rome in 66 CE. As the camera turned, I saw a door that sealed the tomb in antiquity. Then the camera moved silently past ossuaries. A shout was heard by colleagues near me as an inscription came into view. Then, not much later the robotic arm moved again, being directed by a scientist. None of us could believe our eyes. We were all riveted to a drawing that ostensibly broke the second commandment. What was it? What was depicted? What did the early Jew intend to symbolize? The following day we called in Professor James Charlesworth, an expert in Greek and early Christianity, who was in Jerusalem doing research on the Dead Sea Scrolls. After reinserting the robotic arm and swinging the camera once again over to the third niche, we showed him what we had discovered: first the inscription, then the image. He immediately and independently offered the same interpretation we had come to the day before. He excitedly sight-read the inscription. “The Divine Jehovah raises up from [the dead].” He also offered without hesitation the same interpretation of the fish. 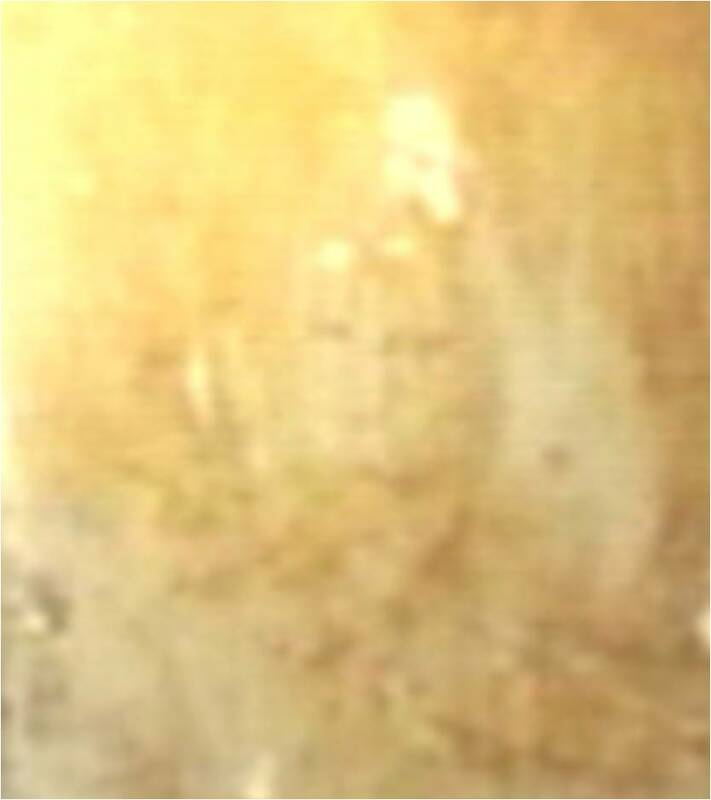 What we are looking at, he said, appears to be the earliest representation from Jesus’ followers of their faith in his resurrection of the dead. A quiet shudder went through the room as the implications of his conclusion sunk in. The Charlesworth account is from the Letter from James Charlesworth, Mar. 31, 2012 on the Foundation on Judaism and Christian Origins website. The Tabor and Jacobovici account is from James D. Tabor and Simcha Jacobovici, The Jesus Discovery: The New Archaeological Find That Reveals the Birth of Christianity (New York: Simon & Schuster, 2012): 70. There are major points of contact between the two accounts, the camera, the robotic arm, "None of us could believe our eyes" and "What we are looking at", the tone. But there are also points of divergence. In the Charlesworth account, some readers might infer that he was present when everyone was seeing this for the first time, whereas it is clear in the Tabor and Jacobovici account that it was a day later. In the Charlesworth account, "a shout was heard" whereas in the Tabor and Jacobovici account there was "a quiet shudder". Indeed, as in the Synoptic comparisons, or the Acts vs. Paul comparisons, there are elements in Charlesworth's acccount that appear earlier in the Tabor and Jacobovici account, which suggests, of course, that the Charlesworth account is somewhat compressed. In Tabor and Jacobovici, "A shout went up in the cramped corridor when we read the inscription" the day before, and similarly "As our camera passed along its façade, a shout went up . . ."
I hope readers will forgive me the indulgence of finding this analogy from our own time enjoyable and potentially useful. For what it's worth, the lack of verbatim agreement between the two accounts is a sure indicator of their literary independence from one another.